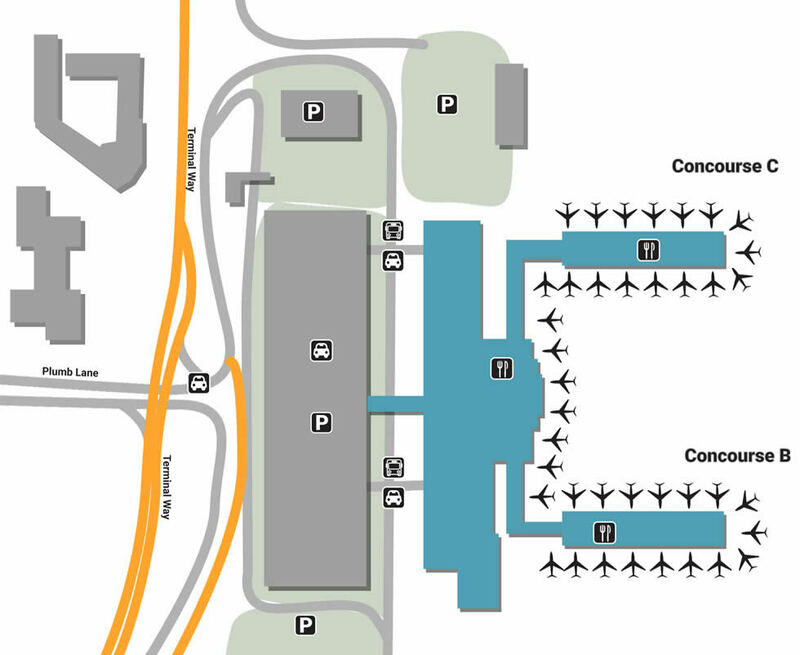 For those unfamiliar with Reno-Tahoe International Airport you can learn more about the landscape of the airport with our terminal maps. Take the simple amenities and unique eateries of Reno’s airport as a welcome mat to the self-proclaimed ‘Biggest Little City in the World’. Located in the foothills of the Sierra Nevada, Reno offers guests easy access to a Vegas-like atmosphere alongside sweeping views of Lake Tahoe. Whether you’re visiting for a full-throttle ski trip or poking your head into a business seminar, Reno-Tahoe International Airport makes arriving as easy as enjoying the vibrant city’s nightlife. The facility is home to one basic parking garage, which encompasses both Short-Term (Level 1), and Long-Term Parking (Level 2). For quick drop-offs, utilize either the Short-Term Lot, or park for free at the Cell Phone Waiting Lot, which is located at the end of Plumb Lane behind Hyatt Place. If you’re worried about height restrictions, head over to the Surface Lot for open-air spaces. In addition to convenience, guest services at RNO Airport is home to some of the friendliest faces you’ll come across. The airport provides a slue of basic services, from free local calls to low-cost luggage as well as specialty amenities like gaming machines that are sure to flip your luck. Make sure your pet gets as much enjoyment out of their stay as you by taking them to one of 3 dog parks. The facility is also home to an arts program that showcases a variety of intrigue, from the hand-stitched fabric of local quilt-makers to a museum that walks guests through the history of Burning Man. Take in your surroundings by reaching out for something more, whether it’s a brave new adventure that can only be accompanied by the high-octane clothing of No Boundaries, located in the High Mountain Marketplace, or a thrilling movie from In Motion, a tech store located in the same area. If you’re in need of some ski gear, shop through the upscale brands at Squaw Valley Mountain Concierge in the Terminal Lobby, or sweeten a local golf trip with some classy swag at the PGA Tour Shop next-door. Ladies, don’t forget to freshen up your outfit with a special accessory from Forever Heather, a small boutique nestled in a quiet corner of Concourse B.
Don’t let hunger ruin a good thing by making sure you stay balanced with a healthy meal. Grab a snack or breakfast sandwich at La Brea Bakery (Concourse B & C) or enjoy breakfast all day at Mountain House Diner, located in the Terminal Lobby before security. If you want a lunch near High Mountain Marketplace, eat at Timber Ridge for healthy flatbread sandwiches, burgers, and a huge list of wine. For those that need to unwind before flying, enjoying a locally brewed growler at Tap & Pour (Concourse C) is a good way to get the job done - and make sure you wake yourself up with a cup of joe from Peet’s Coffee next-door.